Who knew this stuff was here? Certainly not me, even though I’d seen it all before. Growing up just outside of Albany, New York, I’m confident I toured these buildings and museums on any number of school field trips. I’m equally certain that all of those trips were unmitigated disasters. I remember absolutely nothing about them. So powerful is my amnesia that I seemed to have forgotten that Albany had anything at all worth seeing. Even as we traveled thousands of miles seeking out similar locations across the country, touring them in my home state never entered my mind. 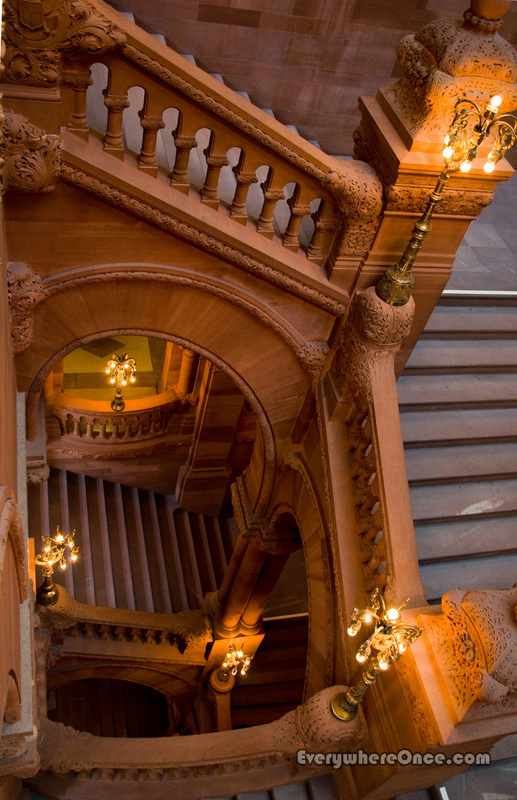 Not even laying eyes on New York’s State Capitol building could shake the cobwebs. Upon seeing it we still weren’t quite sure we had arrived at the correct address. It looked nothing at all like the kind of building we had come to expect from such places. It had no dome, or Doric columns. 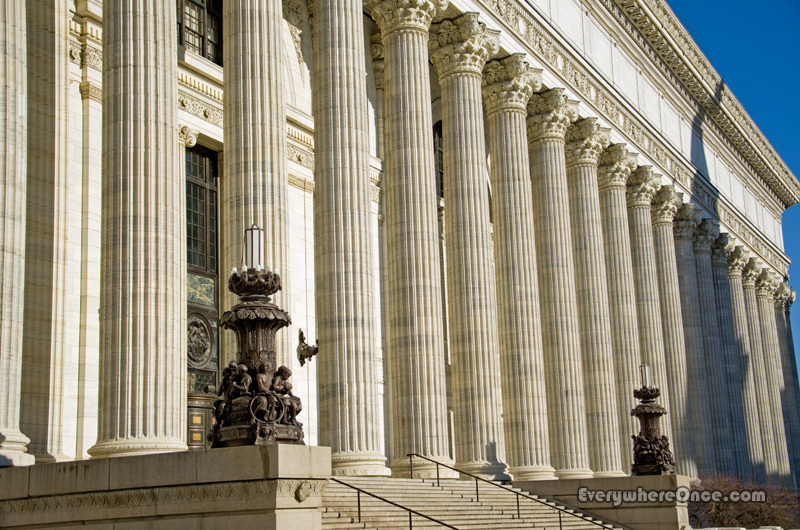 It didn’t mimic the U.S. Capitol in D.C., like so many state capitols do. Instead, it resembled an Italian palace. 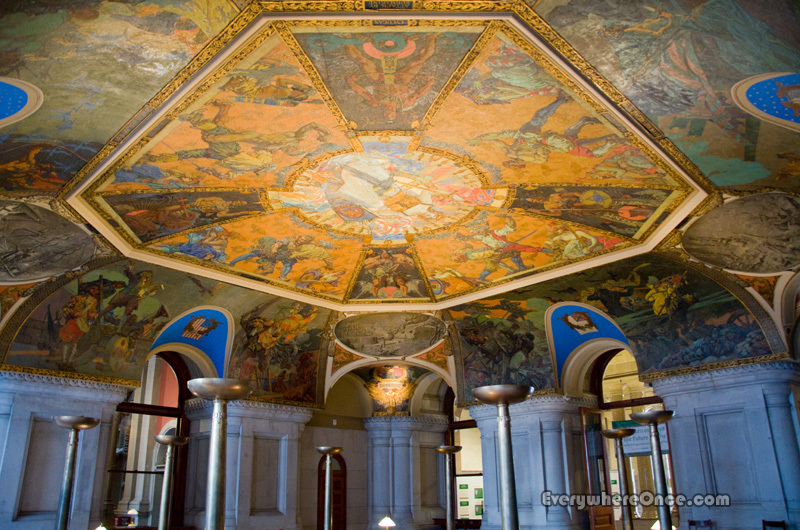 Inside, the Capitol blends styles reflecting the various preferences of the numerous architects and governors who influenced the building over its 32-year construction. 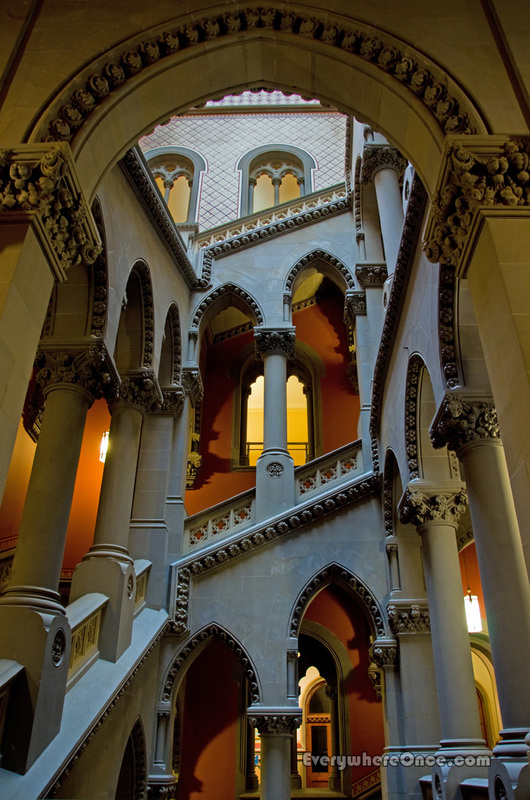 Its Grand Assembly Staircase, for example, achieves the darkly brooding appearance of a medieval castle by fusing Moorish and Gothic elements. Meanwhile, brightly colored murals liven its central War Room. 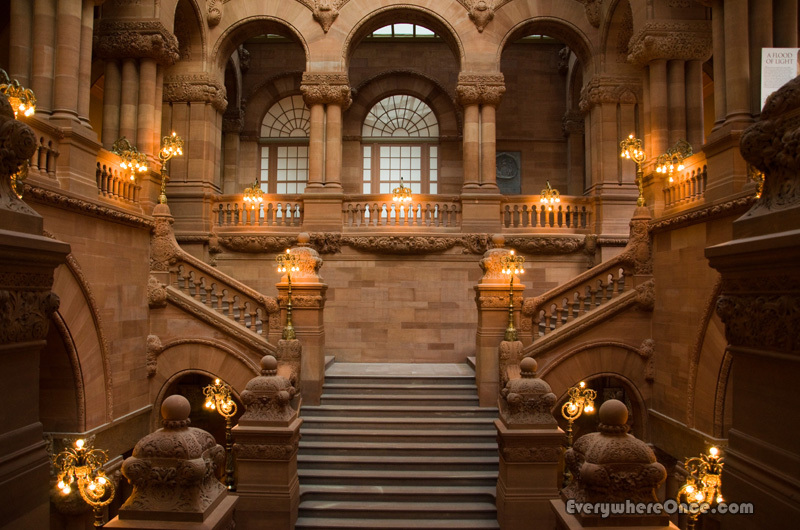 The highlight of the building, though, is its Great Western Staircase. Taking 500+ stone cutters more than a dozen years to construct, the massive structure’s 444 steps rise 119 feet in height. A 3,000 square foot skylight bathes the upper levels in natural light. Leaving the lower levels more dimly lit and crypt like. Back outside, we discovered more in Albany than we could tackle in this single visit. So we stopped by the Merry Monk to contemplate our choices over Belgian beers and cuisine. Instead of finding solutions, though, we found only more choices: such as which of the hundred-odd bottled dubbels, tripels, saisons, whites, or lambics to order or which of the six different moules recipes to sample – not to mention how best to combine the two. Finally fed and “watered,” we decided to make tracks for the Albany Institute of History and Art, one of the oldest museums in the United States. Along the way we passed more great architecture that begged for attention but would have to wait until another day. Best known for its significant collection of Hudson River School paintings, the Albany Institute mostly focuses on presenting and preserving regional art and history. 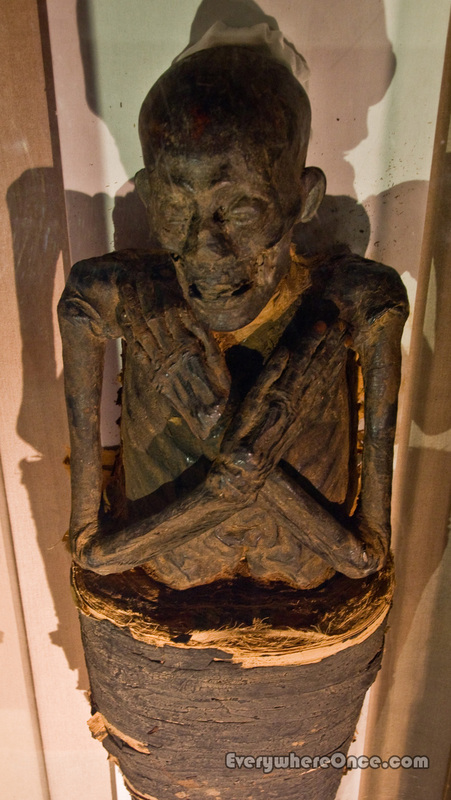 So we were a bit surprised to also find an impressive Egyptian collection that includes, among other artifacts, two partially unwrapped mummies dating back to about 1,000 B.C. It was just one of the many surprises we uncovered while touring our long-overlooked backyard. So many, in fact, we’ll have to plan a return trip to do them justice. If only someone had told us earlier that all this stuff was here. 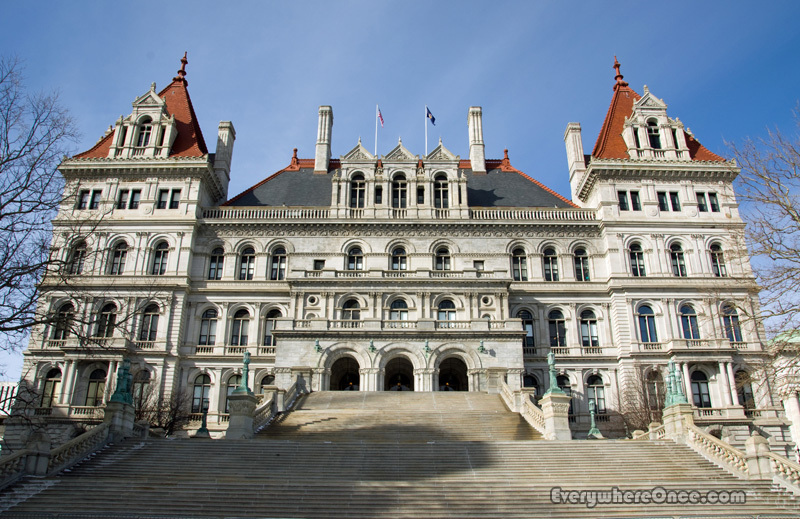 I’d have to count but I think we’ve visited more than half of all the U.S. state capitols, and Albany’s is one of the best. So glad we finally made the trip. Beautiful capitol building! It’s my “back yard” that started me on my TouringNH blog. I’ve photographed lighthouses up and down the east coast, but don’t have all 5 in NH. People so often miss all their back yard has to offer. So true. We’re trying to change that by pretending we’re tourists in our home towns and searching out interesting things there just as we do everywhere else we visit. As I scrolled down and came to the second photo its architecture captivated me. The photo drew me in. The lines are truly beautiful. This creative work stirs the heart. Albany, it seems, is certainly a place to visit. I like your comment about your long over-looked backyard. It’s easy to go elsewhere to find things to see, but one so often forgets what is right under his nose. Albany looks interesting. Capitol buildings is something I like to visit while traveling. Nice pictures. They provide a good feel as to the size of the capitol. We’re certainly guilty of taking things for granted that are close by. We’re trying to change that. This is stunning! I want to go there. Indeed has an Italian “air” than American one, very interesting. Thank you for the tip, I’ve been in Albany many times but…shame on me. Thanks for sharing the inside pictures! I’ve been to Albany but never in the Capitol. Or the egg shaped thing. I don’t even know what it is. I love having visitors because it gives me an excuse to see stuff I’d never get to on my own. Fantastic photos! All I’ve seen of Albany was through the windshield & the driver’s side window of a Honda Accord, en-route from Quebec to Queens, NY, on a rainy & dreary dusk on a Sunday in Fall. I had detoured from the Thruway to catch a glimpse, and it was too late for anything. Appreciate the good look inside, and again, fabulous pictures! It is funny how we do over look whats in our own backyard!! I was watching my favourite youtube channel the other day, and the family was walking past this very building in the Capitol!! They didn’t go in and show how beautiful it so thanking you for sharing the gorgeous staircase, the ceiling and the history of how it was made. 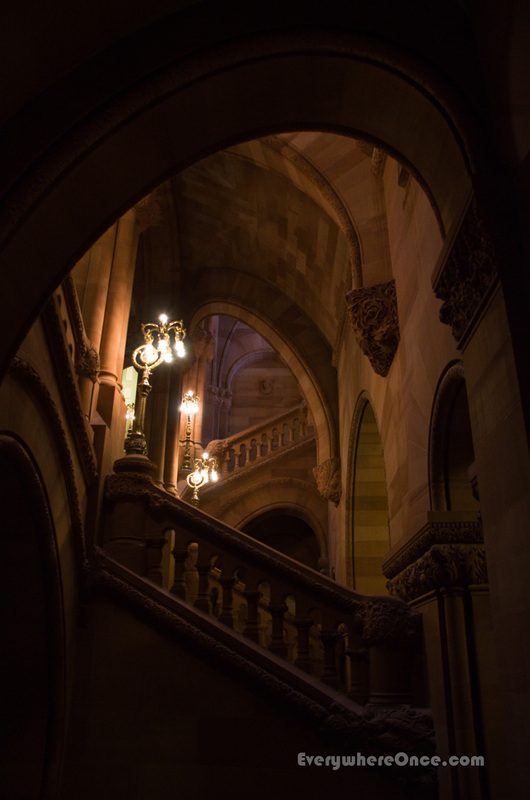 The Albany capitol building is one of the prettiest ones I have seen. Thanks for the tour. Wow! Wow! 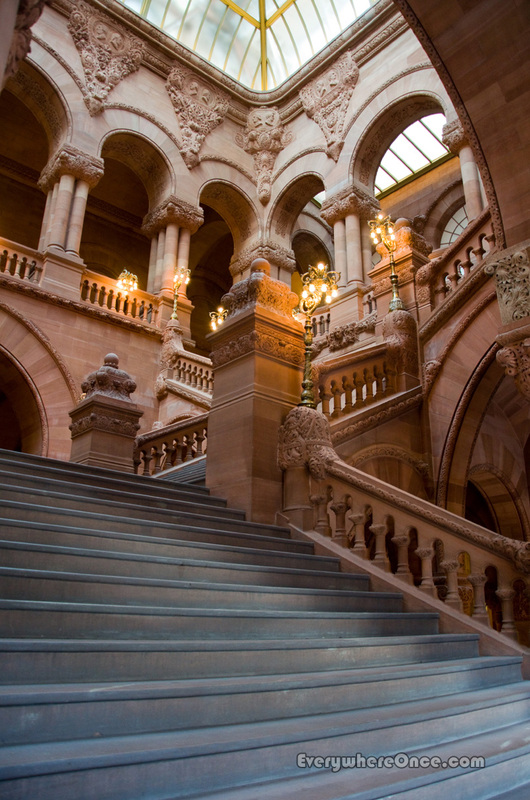 The architecture at the capital building!….stunning! Just….wow! As always……thanks for sharing! It’s very true that we often could do more to appreciate our own backyard. I’m trying to do that as we get more and more settled in to Duesseldorf.